Oh, my god, the food. The food! The wonderful, fantastic, melt in your mouth food that place served! SO had venison in wine to make the gods jealous. Friend Anne had lamb to make you weep. I had mushrooms on toast. But such mushrooms! Such toast! They were tender, they were slightly sweet. I think there was sherry or wine involved. It makes me want to spend thousands of dollars to fly back and have lunch there again. EatScotlands' independent assessor said: "Oakwood offers an unusual mix of gift wares and good cooking within a comfortable restaurant, ideally situated for Loch Ness." Pea & Ham Soup "A hearty bowl of soup with good colour and a thick consistency. The soup was made with good ingredients and plenty of bacon or ham. A rustic soup with a very good flavour. A well made soup." Hand Dived Scallops with Bacon & Served on a Bed of Leaves "The scallops were cooked to preserve the flavour and texture. A very well balanced dish with an excellent knowledge on how to cook shellfish evident." 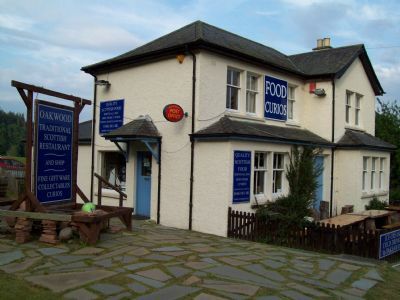 The Oakwood Restaurant at Dochgarroch serves some of the best local food we have ever tasted from steaks to seafood. The prices and service are excellent and the surrounding quaint and friendly. We strongly recommend a visit if you are in the Inverness area. Second day in Canal at Dochgarroch, we couldn't start engine. The starter motor had gone. Fortunately a boatyard about 5 mins away by car and got an engineer on board that morning. He was able to get a spare part from Inverness and by early pm we were on our way again. At Dochgarroch we discovered the Oakwood Restaurant. It was unusual in its interior in that one end was the Post Office, and it had a gift shop with wares for sale hanging from ceiling, but the food was terrific. We all had venison, casseroled or as a steak, but absolutely delicious - the best we have tasted.